The narcissistic mother takes pleasure in creating a situation where the siblings have to compete for her attention by unfair means. This can create jealousy between the siblings, making them become arch-enemies. Due to the deep emotional scars that the mother creates, there may be little connection between the siblings as they grow up. None of the narcissistic mother’s children realises that they are their mother’s puppets where the roles may switch at any time. Without any awareness, they will each take their turn of becoming either the persecutory villain, the victim or the rescuer in the drama triangle as their mother dictates the outcome of the family dynamics convoluted dance. The Victim (which is the “one down position”). As the child of a narcissistic mother, one is going to find oneself caught in the Drama Triangle with the mother’s pathological conflict one way or another. THE VICTIM STANCE: When we talk about the victim, we are not talking about an actual victim, but rather someone who is acting the victim. However, even though they are acting, they sincerely feel that they are being victimised, oppressed, hopeless, ashamed, etc….they are engaging in the “Poor me!” stance. THE PERSECUTOR STANCE: The persecutor will go out of their way to control, blame, criticise. They will come across as being superior, self-righteous, angry, oppressive. No matter what happens, the persecutor will always insist that you are at fault. THE RESCUER STANCE: The rescuer is the consummate enabler who suffers guilt if they don’t rescue the situation. Unfortunately, their rescuing can have adverse effects for the victim; it keeps them dependent on others and robs them of the experience of learning how to solve their problems. For example, if the narcissistic mother enters into conflict with one of her children, she will see that child as her persecutor, and herself as the victim. She will always involve her other children in the conflict. She will expect them to rescue her and become her enabler and accomplice to further discredit her victimised child (unwittingly or wittingly). All three participants become drawn into, or even seduced, by the energy that the drama generates. Unfortunately, the real issue becomes obscured, and confusion escalates, the focus becomes on winning the argument rather than finding a solution to the problem. In reality, it is the narcissistic mother that is the persecutor who is abusing and exploiting both members of her family (i.e. it may be both siblings, or the father and a child). 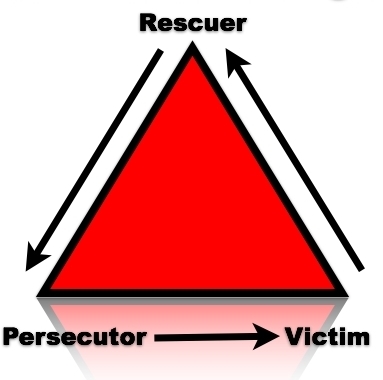 It is no mistake that the triangle shows the “Victim” at the top of the triangle on their own, while the narcissistic mother, the “Persecutor” sits at the broad end of the triangle with her “Rescuer” in allegiance with her. This loyalty causes divisions between each of her children and their father. With the interlocking of the three roles, the actual victim is left confused at what has just happened. The fact that the mother is joined by her rescuer, (who unknowingly backs up every word of her manipulation), means that once again, the victim is left swimming in a pool of blame and shame, and they are yet again “the problem”. RECOGNISING WHAT IS HAPPENING: When you can recognise what is happening in the relationship, the good news is that you can choose to get off the “drama triangle” (regardless of the role you find yourself in). When you do that, it changes the whole dynamic between you and the others in the family (or workplace, or friendships, etc.). Getting off the triangle calls for different action, and a willingness to negotiate putting down new boundaries when necessary. It also requires that we look more closely at our behaviour with curiosity and understanding. In that way, we remain connected to our self. This allows us to take decisive action, such as choosing to walk away from the situation rather than trying to defend ourselves from within the manipulated triangle, rather than becoming a persecutor ourselves. The goal is to stay with the truth of the situation and allow others to behave according to their story. It does not matter if the stories do not match, what is important is that you liberate yourself through self-responsibility and truth. Not allowing yourself to get caught up in your mother’s Drama Triangle, where there is no room for truth. Getting “off” the Drama Triangle is not something you do just once and it then it lasts for all time. Think of it more as a process, and not a final destination, where you will most likely find yourself getting on and off repeatedly with your narcissistic mother. As long as we stay in the drama, we allow ourselves to get caught up in all types of conflict that lock us into rigid and self-punishing roles that limit us beyond measure. PreviousWhat Makes A Self-Absorbed Narcissistic Mother? NextWhy does your narcissistic partner always blame you? The drama triangle was a constant for me and my sister and two brothers. All thru our childhood and on into adulthood. We actually teased each other occasionally about who’s turn it would be next (to be the perpetrator) All four of us are now no contact. Christine, it’s great that someone is doing this work here in Ireland, it’s so hard to find any counselor doing this here. Our narcissistic mother got off the triangle herself by dying, our father was certainly her enabler with my sister and I playing playing the rolls of victim & rescuer, I looked back through the generations to see how my parents also were raised by Narcs themselves. I only started to learn about all this when I started to date and then married a narc myself, after years of emotional abuse and affairs they walked out and I’m just coming to the end of my divorce. I recognized how my upbringing had lead me to seek out narcissistic partners in later life. After three years of hard work on my self and often looking at things in myself that were hard to face I have now moved on and recently met someone who is much healthier. But until you do the work on yourself you are distend to repeat this pattern until you learn the lesson you need to. Boundaries doesn’t always mean walls or no contact. Boundaries are psychological and behavioral stances, where one can practice connecting minus the sickness, and sweetly disconnecting from a narcissistic ploy or attack when that occurs. If you can so it somehow go no contact…it really makes no sense having all this narc nonsense around you. It will make you very sick in the long run even if you are not taking part in the drama triangel anymore. None of the narcissistic mother’s children realizes that they are their mother’s puppets where the roles may switch at any time. Without any awareness, they will each take their turn of becoming either the persecutory villain, the victim or the rescuer in the drama triangle as their mother dictates the outcome of the family dynamics convoluted dance. THE RESCUER STANCE: The rescuer is the consummate enabler who suffers guilt if they don’t rescue the situation. Unfortunately, their rescuing can have adverse effects for the victim; it keeps them dependent on others and robs them of the experience of learning how to solve their problems.HERE IS AN INTERESTING TWIST WHERE WHAT CAN HAPPEN AFTER SO MUCH BLAMING OF THE FATHER OF NOT DOING HER RIGHT AND THAT HAS CAUSED SOME PROBLEM WITH THE KIDS THAT THE FORM OF DISCIPLINE ON THE CHILDREN CAN AT TIMES MAKE IT SEEM LIKE THE CHILD’S BEHAVIOR IS A PROBLEM AND THAT IT IS THE FATHER’S ROLE TO CORRECT THE CHILD THEN THE FATHER CAN BE MADE TO LOOK IN THE CHILD’S EYES AS THE SOURCE OF TOO HARSH OF A TREATMENT AND THEN THE MOTHER CAN CASTE HERSELF IN THE ROLE OF RESCUING THE CHILD FROM A HARSH FATHER…. For example, if the narcissistic mother enters into conflict with one of her children, she will see that child as her persecutor, and herself as the victim. She will always involve her other children in the conflict. She will expect them to rescue her and become her enabler and accomplice to further discredit her victimised child (unwittingly or wittingly). All three participants become drawn into, or even seduced, by the energy that the drama generates. IN EITHER CASE AS THE FOLLOWING TEXT SUGGESTS> Unfortunately, the real issue becomes obscured, and confusion escalates, the focus becomes on winning the argument rather than finding a solution to the problem. With the interlocking of the three roles, the actual victim is left confused at what has just happened.< AH BUT WHEN I BEGIN TO SEE THE ONGOING ISSUES AS MAINLY BEING ENERGIZED BY A NARCISSISTIC MOTHER THEN THERE THE LINGERING STRUCTURE PUT IN PLACE BY THE NARCISSISTIC OFTEN CAN WORK TO PICK UP ON THE ONE WHO BEGINS TO SEE THE DEEPER ISSUES AND TO CONTINUE TO PLAY THEIR REMAINING ISSUES AND PROBLEMS AGAINST THEM RATHER THAN TO BEGIN TO UNDERSTAND THE DEEPER HEALING ISSUES AND BLAME THEM FOR SEEING THEMSELVES OF A VICTIM OF THE TWISTED WAYS OF A NARCISSISTIC MOTHER THAT WAS THE PRIMARY SOURCE OF PROBLEMATIC ENTANGLEMENT OUT OF HER NEED TO MAINTAIN HER NARCISSISTIC SELF IMAGE.. THE FOLLOWING BEST FITS DAD IN TERMS OF MOM WHO DAD AT FIRST RECOGNIZED SOME OF HER DEEP PROBLEMS BUT IS COWED INTO ACCEPTING THAT HE WAS THE REAL PROBLEM AND SHE BECOMES HIS HERO AND WHEN I[YOUNGEST OF 3 AND ONLY SON] TRIED TO BRING FORTH GOOD EVIDENCE WHAT HAPPENED TO HIM AND MYSELF INSTEAD OF SEEING THAT HE BACKS UP MOM'S NARCISSTIC SELF IMAGE OF HERSELF AS REAL The fact that the mother is joined by her rescuer, (who unknowingly backs up every word of her manipulation), means that once again, the victim is left swimming in a pool of blame and shame, and they are yet again “the problem”. RECOGNISING WHAT IS HAPPENING: When you can recognise what is happening in the relationship, the good news is that you can choose to get off the “drama triangle” (regardless of the role you find yourself in). When you do that, it changes the whole dynamic between you and the others in the family (or workplace, or friendships, etc.). Getting off the triangle calls for different action, and a willingness to negotiate putting down new boundaries when necessary. It also requires that we look more closely at our behaviour with curiosity and understanding. In that way, we remain connected to our self. This allows us to take decisive action, such as choosing to walk away from the situation rather than trying to defend ourselves from within the manipulated triangle, rather than becoming a persecutor ourselves. I just want to say thanks and God bless Christine your work has been my liberation in trying to understand the internal workings and abusive behaviours of my sister and mother in the past. Gaslighting, the need for narcissist supply, constant non-stop verbal and emotional nagging/abuse over the pettiest of things and a complete lack of empathy is common amongst them. I have served them well only to be tossed to the pavement in my hour of need. Thank you Christine, you are doing a service to the world. How can we victims recover from their abuse? Can you give us some help on getting them out of our heads. How can we stop hurting (and let the Narc feel the pain of their abuse – instead of us? I was raised by a narcissistic and very abusive mother. She was mean and wasn’t really supportive even though she provided a good life money wise. However, she really hurted me a lot to the point that I became narcissistic myself without even knowing. I’m 37 yrs old now with a beautiful wife and two daughters 13 and 9 and I’m looking forward to stop the cycle of narcissism in my generation. God is good. Share nothing with the game players, absolutely nothing.